I’ll admit my bias up front. 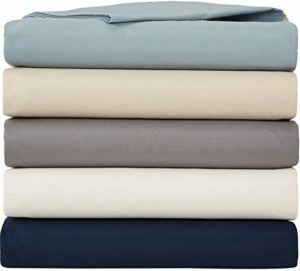 Though I wrote quite a few of these round-ups looking at all different types of sheets, microfiber sheets are my own personal favorite. Recently upgrading to a king size bed, I bought a wonderful new set of crisp, microfiber sheets in yellow to brighten up my bedroom. And I am absolutely in love. So how do you know where to start and how to choose the best microfiber sheets? Before you head out to the store (or over to Amazon, let’s be honest! ), it can be helpful to see a microfiber sheets review to determine what others like and don’t like. This is the guide for you. The good news about microfiber sheets is that they are affordable, even in the most expensive options, and durable. Here are out top picks and short reviews to help you make your decision. If you’re looking for a quality but budget-friendly microfiber sheet set, this set from Bare Home is a great choice. At a mid-range price for a set of 3, you can choose from a number of colors and get a great deal at the same time. This set is also available in split sizes and other hard-to-find size options. The material is described as durable and soft. As with any microfiber sheet, there is no grade for thread count, but users agree that they are exceptionally comfortable when compared to more expensive, high thread count cotton sheets. These sheets from SONORO are described as luxury and the reviews support that assertion. They are wrinkle free and billed as hypoallergenic. They are deep pocket sheets with good elastic to help the fitted sheet stay secure. You get six pieces, including additional pillow cases, to complete the set. There are eight color options, so a decent variety, but certainly not as many options as some of our other recommendations. 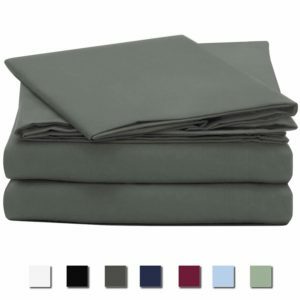 For the budget price range, Amazon has produced this quality microfiber sheet set. They are also deep pocket sheets and reports indicate that they stay in place when the bed is made. 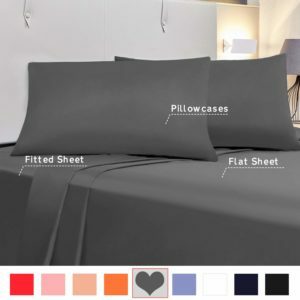 The overall reviews are great, and they are really meant to be a budget option for microfiber sheets, so keep that in mind when making this purchase. But users indicate they are durable and soft. For deep-pocket mattresses, the affordably priced sheet set from Allo is a great choice. It’s wrinkle resistant and breathable, which will help keep you cool at night. The set comes with a flat sheet, a fitted sheet, and two pillow cases. 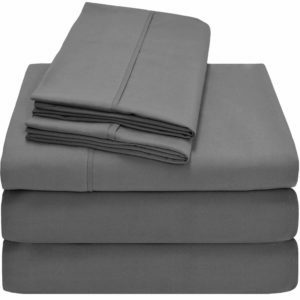 Customer reviews indicate the fabric is durable, the color is true, and the sheets are soft and comfortable. 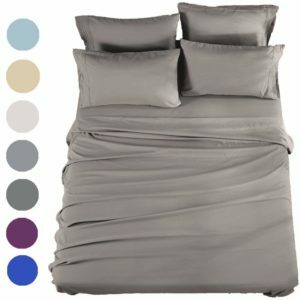 This 3-piece sheet set is highly rated by Amazon customers. They are durable, stay solid after laundering, and fit well. Users indicate they do not wrinkle or pill during use. Colors should also hold up quite well, as these sheets are fade-resistant. They are also soft and cool, which can be a major draw for many sleepers. 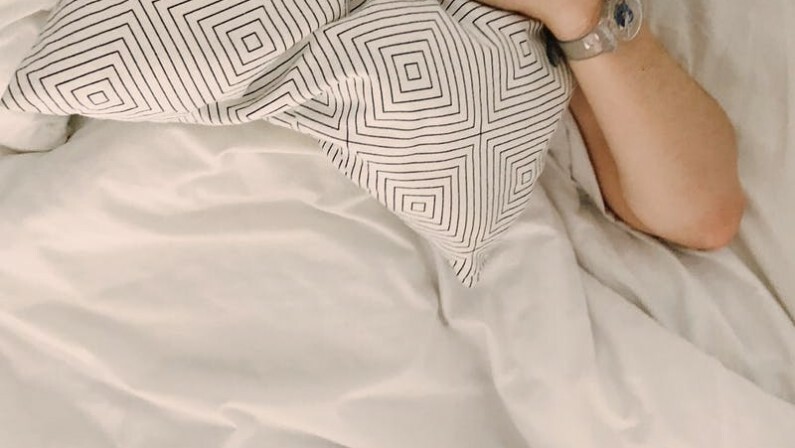 Staying cool at night is a number one request when it comes to the right sheet set. Microfiber sheet sets are becoming very popular, and because of that you can find them at your local bedding stores as well as online. Buying online with Amazon gives you the comfort of reviews as well as the ability to have it shipped and the customer support if anything doesn’t work out. Microfiber sheets are easy to wash. They can be run through the washing machine on a regular cycle, making them very easy for busy households. You can wash them on warm or hot and use a mild detergent. Don’t use fabric softener, it can get into the spaces between the material and affect the feel of the sheets. What makes us experts in microfiber sheets? Experience – Our SleepZoo team love to sleep, and loves to talk about the ways we get better sleep. President Chris Brantner is a Certified Sleep Science Coach and reviews all of our content to ensure that we’re providing the best information to readers. Chris has been featured in Forbes, Bustle, NBC News, and more demonstrating his sleep experience. Passion – Helping others get a good night’s sleep is a top priority for us. We know that good sleep is a good foundation for everything. We work hard to offer the best resources, tips and buying guides online. Testing & Research – We engage in research and hands-on testing to determine the best products on the market before curating these reviews. We utilize first-hand testing, third-party resources, and verified customer reviews to gather our data. Not all sheet sets are created equal. And as someone who also uses microfiber sheets exclusively, I wanted to provide an unbiased review for readers. Price – While microfiber sheets are affordable overall, we aimed to share multiple price points. From under $20 and up, we shared multiple entry points. Reviews – Reading customer reviews allowed us to understand what people liked and didn’t like about each sheet set. We then pulled the top-rated sheet sets for our list. Quality – Based on manufacturer information and reviews, we also looked at the durability of these sheets before making a recommendation. What is a Mattress Pad? Why Use a Mattress Pad?